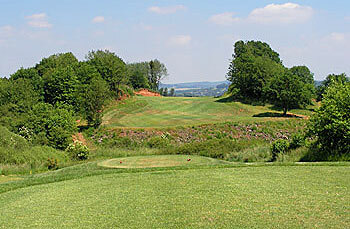 Interesting sites for building golf courses are becoming increasingly rare, but at St Wendel a great opportunity presented itself when the French military left the city in 1999. The barracks at St Wendel were built in 1936, but had been taken over by the French in the aftermath of World War II, when the Allied Forces occupied Germany. Part of the military facilities was a training area for tanks and foot soldiers, which can only be described as an almost undisturbed, natural wilderness. Rumours have it that the permitting process took all of two weeks, since the local mayor figured his city might need some new jobs after the closing of the barracks. Today the entire area has been transformed into a huge leisure park with various activities and a complete golf resort with a high-end hotel as its centrepiece. St Wendel, by the way, is named after St Wendelinus, a holy man from the 6th century. Once every decade his bones are on display in the local cathedral. More to the point, legend has it that St Wendelinus was the son of a Scottish king, so it seems entirely fitting that the golf resort is named after him. The view from the clubhouse terrace (or, as it were, the hotel patio) is something to behold: 27 ferocious holes, organised in three loops, start and end here, all in plain view. The routing refuses to slow down further afield, as it winds up and down, left and right through unfathomable terrain. The golf is spectacular and hard; it will often take its toll on the player's ball supply. But even though the course uses every single natural feature available – and there is an abundant supply of them – it never resorts to all flash and no substance. So thrills aside, there is some very solid golf to be played and creative shotmaking will be rewarded. One valid criticism is that only the A loop is a contiguous walk, whereas B + C visit a dramatic hill on the edge of the property, which, for the faint-hearted, is more practical to negotiate in a cart. Despite the undulations of the site it would be a joy to walk were it not for those few disappointing treks. Previously the cart paths were limited to these transitional spaces, so there were no artificial blemishes on the holes themselves. This has unfortunately changed lately and the course lost some of its natural appeal as a consequence. The landscape still isn't especially trimmed or groomed to maximise visuals, though. Ultimately, it may or may not be considered proper golf, but there can be no denying that the Wendelinus roller coaster is a cracking experience. Many of the holes here would be signature holes elsewhere.